Yes, I have finally cogitated upon the matter of the recurring spice-blogging event enough and thus come to a few conclusions. The deadline for entries will be on the 15th day of every month, meaning that for the first challenge, which will be in April, you will have extra time to think about it. I will announce the next month’s theme on the 15th of every month, here, as well as on the Food Blog Skool calendar and at IMBB, so you have several places to go to find out what is next in the queue of challenges. The deadline is for you to send your entry to me by email–not a specific day you must post about your entry. I like the way Meena has arranged her “From My Rasoi” event, where sometime during the month, when you get around it and it fits your dinner schedule, you post your theme-perfect entry, and then by, on or before the deadline, you send her your emailed entry. This sort of flexibility I think is admirable and will help a maximum number of people join in the fun. This is for fun, but I may choose winners and offer silly prizes now and again, and have guest judges so it isn’t just me and my own biases at play (or at work). 3. Your entry should include some background about the spice you have chosen to highlight. Whether this is something you learned from books, or that was passed down from your grandma or is from your own experience, tell us about it. Tell us why you chose this particular spice to highlight on this particular month. Describe how it tastes, and why you like it. 4. The recipe does not have to contain only the one spice you are posting about, however, the flavor of that spice should predominate. Say, you have chosen cardamom, and want to post an Indian dish featuring it. You could choose kheer–Indian rice pudding–which is predominately flavored with cardamom, which is fine, but you could also choose sindi elaichi murgh— a dish which has other spices in the masala, but the cardamom flavor soars above the other flavors, supported by their presence. 5. Finally, the definition of a spice that we will be using for the purpose of this event is as follows: “Any aromatic substance, fresh or dried, that is derived from the root, rhizome, bulb, bark, woody stem, flower, fruit or seed of a plant that is used to flavor foods.” You will notice that I left yout soft stems and leaves–that is because those are herbs. I didn’t want to step on Kalyn’s toes with her Weekly Herb Blogging event at Kalyn’s Kitchen. I am also not counting minerals, such as salt, as spices, though we may have a special “salty” edition of the “Spice is Right” challenge someday in the future. You can take that to mean anything you want it to mean. It can mean spices that were used in the ancient world, that aren’t used so much anymore. You can interpret it to mean the can of curry powder you have in your cupboard from 1962. 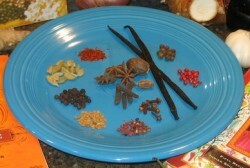 You can take it to mean a spice that has a very long history of use. You can use an old recipe that is written in Middle English that features your chosen spice. The field is wide open. Oh, this is a nifty idea! I’ve been a little burnt out on the shear number of food blog events of late, but I like this one very much. (As will Chopper, who is a spice fanatic.) Great excuse for more food-related research, too! As a compulsive spice gatherer (it’s nearly as bad as my cookbook addiction, but fortunately spices take up less space),I both welcome and fear this challenge. Ever since we got a local Penzey’s, I have been out of control.I may have to tidy my spice drawers (2) and cupboards (1) in preparation! Which of several interesting spices, thus far used only once or twice, will it be? Any excuse is a good excuse for some food-related research, Mrs. D! And I am glad you are enjoying my blog–thank you. Sailaja–I look forward to what you come up with! Lindy–I love the Penzey’s store in Columbus. Adore it, love it and have spent way too much money there. Luckily, I have used all the stuff I have spent the money on, so nothing is wasted, but still–my spice cabinet looks all matched up and pretty, because of my Penzey’s habit. That is, until you go to the bulk spices area in the pantry–then everything isn’t quite so nice, neat and tidy…and matched. Ooooh, I’m excited. I had already had an idea of what I wanted to do for a spice blogging post when you announced it and I’m very happy to see that it will quite nicely fit in perfectly to the “ancient spices” theme. I think I have some glimmerings on inspiration on this already. I have in mind something that isn’t precisely to my tastes, but which will make a fabulous gift for my mother if it works out well. Now I am all curious to know what goodies people will be sending to me…. Just saw the announcement on Is My Blog Burning…what a nifty idea. Cool Jasmine–I hope to see an entry from you. Barbara, this sounds delightful! I will certainly be participating, and am already looking forward to seeing what everyone else submits. I look forwad to what you send me, Cate and Tania! At least I’m pretty sure that’s right…. It took me some time to decide on a particular spice to feature in this first edition of “The Spice Is Right” (see description and rules here at Tigers & Strawberries). Some days ago I just published the recipe of Cardamom chicken in German, then I saw there is a new food blog event called The Spice is Right hosted by Barbara of Tigers and Strawberries. A good coincidence for me!